Anytime one considers opening up a wall for a pass-through, doorway or as a combining of two rooms, you face the possibility of finding cables and wires running through the area that you want to remove. This can be a very frustrating experience, and while there is no single method or technique used to re-route electrical cables, the following information may assist the home handymen in re-routing the cables that are in there way of completing the project. Always remember that it is a major fire hazard to make electrical connections inside walls and/or to make connections that are not contained in an accessible electrical box with a cover. In many cases, the method chosen to re-route cables is based on access to other parts of the home. Finished attic spaces and basements can add to the re-routing dilemma, but if you stand back and study the situation I am sure you can find a routing that can be implemented. The following assumes that the individual undertaking the re-routing has some electrical knowledge. If you need a refresher course on wiring for electrical outlets (receptacles) and switches please check out the electrical index. For the purposes of this article we have chosen the construction of a new doorway, but the information applies to any cut-out in a wall that has an electrical outlet (receptacle) or switch wiring. Figure 1 shows what was found on removal of the drywall. 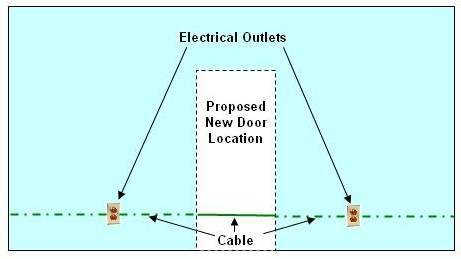 Electrical outlets (receptacles) are located on both sides of the proposed doorway and not surprisingly they are wired together. Thin gauge metal coat hangers and string come in very handy when fishing wires. 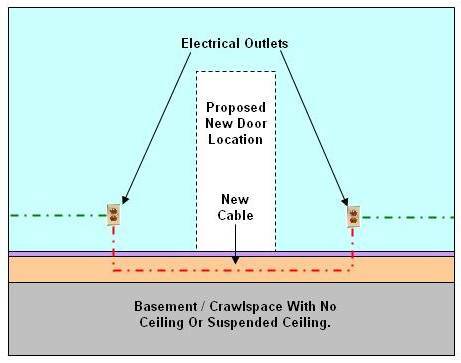 This alternative presupposes that you have access from a basement or crawlspace below the electrical outlets (receptacles). Run a new cable from the first electrical outlet (receptacle) to the second electrical outlet (receptacle) through the floor and the basement or crawlspace ceiling. After removing the baseboard or molding beneath both electrical outlets (receptacles) you should be able to drill holes on an angle through the floor boards (hidden behind the baseboard when it is replaced). With a little patience you should be able fish a wire through the first electrical box, through the first hole beneath the receptacle under the floor (preferably drilling holes in the floor joists to accommodate the cable), up through the second floor hole and into the second electrical outlet (receptacle) box.